Welcome to The Cooker. Glad you could stop by. Based in Dundee Scotland, The Cooker is Deryck Wallace - a freelance web and interactive designer. I create gourmet interactive digital media products. Including fresh and tasty website design, iOS apps for iPad and iPhone, Flash applications, games, online advertising, touch-screen kiosks and interactive DVD/CD-Roms. If you would like to get in touch to discuss a project feel free to get in contact by email. Only the finest free range code and design goes into my work, so you can be sure all work will not only be engaging and eye-catching, but also valid, accessible and search engine friendly. Take a look at some of the tastiest recent work. NESTA (National Endowment for Science Technology and the Arts) were looking for a talented web developer to create a social network for their UK based creative entrepreneur start-ups and trainers. The Cooker designed and styled the CreativeSupporters.org.uk site to tie in visually with their creative entrepreneur toolkit and allow collaboration through an online community. The Krill Bill Interactive touch-screen was developed as part of an exhibition at the Discovery Point Visitor Centre in Dundee. It was designed to give school children an insight into the effects of everyday human activity on the Antarctic environment in an entertaining way. You can download the 'Penguin Drop' sub game for Mac OS X and Windows (7.5mb). The Jewellery Doctor required both a website and the creation of bespoke presentation software to run information about current promotions on their in store TV displays. Designed as part of an event for the Co-operative Financial Services and Britannia the Heritage Tunnel was 9 meters long and displayed a timeline for CFS and Britannia on opposite walls. The full length of each wall was filled with a backlit graphical timeline of each companies history with video footage displayed on plasma screens mounted in the tunnel the walls. Winner of Best use of Interactive Media at the CiB Scotland awards in 2008 and the Silver Screen award in the Professional Education category at the U.S. International Film & Video Festival in 2009. This DVD-Rom produced for the Scottish Government is an educational resource containing materials to help improve educational and life outcomes for looked after children and young people. It combines video audio and text resources in a fluid interface plus a searchable database of downloadable documents. Three touch screen kiosks were developed for the FSAS to be part of their stand at events including the Royal Highland Show, The Dundee Flower & Food Festival and Taste of Grampian. The aim of the kiosks was to educate children on healthy eating habits and how to store and prepare food safely. The kiosks also recorded evaluation data to show how well participants did playing the games. Hungry for some succulent interactive Flash? Or are you after a nutritious, accessible site with a CMS to give you control of your sites content? Perhaps you need a meaty media rich touch screen for an event or exhibition, or even a tasty mobile app for iPad or iPhone. In my larder you'll find ingredients to whet the appetite and make your project extra tasty. Website design and creation, Interactive applications, touch screen kiosks for delivery on both Mac OS X & Windows platforms and print graphics. With all this plus over 12 years industry experience The Cooker is an ideal choice to work on your web, interactive or print based project. Click on post titles to comment. This weekend WASPS (that's Workshop and Artists' Studio Provision Scotland) are opening up their studios to the public. Nine of their seventeen studio complexes will be open this Saturday and Sunday. The open weekend is a great opportunity to go and see the work of some local artists in their own studios. A wide array of disciplines will be on display including ceramics, drawing, painting, printmaking, sculpture, digital media, photography, jewellery and installation. You can get full details on the WASPS website. There's also a photo collection on Flickr if you want to have a look at the kind of work that will be on display. Last years' digital art fest NEoN was such a success that they decided to do it all again this year. The Dundee festival is aiming to be bigger and better than the 2009 inaugural event. The speakers for this years NEoN have been announced. The 2 day conference starts in around 6 weeks and should be a must for anyone interested in digital art, particularly character design - speakers include the likes of Pictoplasma and TADO. 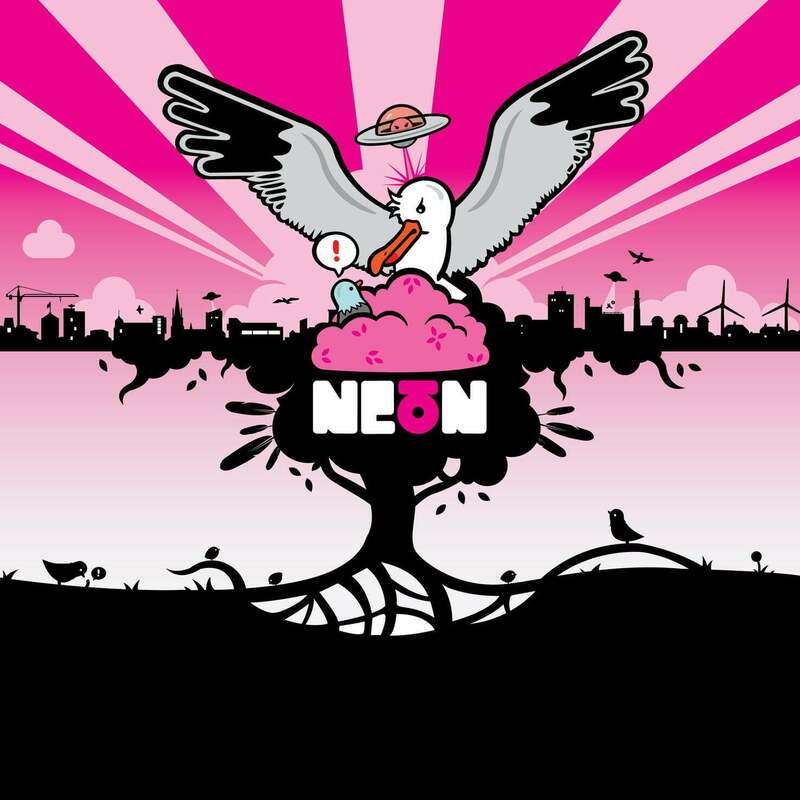 I'm also hoping to see Ian Anderson of the Designers Republic making an appearance, unforescene events forced him to pull out NEoN '09. As the theme is 'character' this year, there's a character design competition to enter which could bag you £100, NEoN tickets as well as the chance to get your design printed on a T-shirt. Early bird tickets are available until the 4th October which knocks £25 off the normal price, there are also heavily discounted tickets available for students.